I think everybody can identify with those moments when you're brushing through your album collection, looking at everything you have to choose from, and nothing seems to fit your mood. You might have a few hundred albums but it doesn't matter. Recently I found myself in one of those moods. Nothing seemed to draw my interesting, and I was worn out from the day. 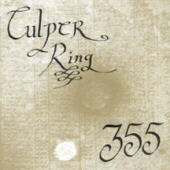 Yet suddenly I realized that I had a copy of Culper Ring's latest album "355" sitting around. It proved to be a perfect album for those times when you just want to sit back, relax, and free your mind. Culper Ring is the result of Kris Force (Amber Asylum), Mason Jones (Subarchanoid Space), and Steve Von Till (Neurosis, Tribes of Neurot) getting together and jamming circa 1997. Nothing managed to formulate from these jam sessions except a few tapes that were left to collect dust over time. However, these tapes were revisited and subsequently, the trio started to breathe some life into what they had started. Imagine the fertile soil. On the soil the lives of different flowers and grasses will rise. To the unconcerned eye, it is a simple setting. It is commonplace, and not of much value. However closer speculation reveals minute details. The scene is flourishing with life. This can be related to "355." It is largely the product of soundscapes that have painted by electronics, gentle guitar works, and other subtle details such as occasional whispers and likeminded effects that solidify and dissolve out of nowhere. It is a very colorful album that takes the listener as far as they want to go, with more than satisfying results even if you don't delve deep into Culper Ring's world. Bottom Line: For those that find themselves open minded when it comes to music, Culper Ring might be a band that you find takes you down a path that isn't explored by many bands. "355" is not for everybody, but those who find pleasure in it will find it in abundance.